After nearly two decades, Darren Kalvig still considers the chance he took on POET one of the smartest things he’s ever done. 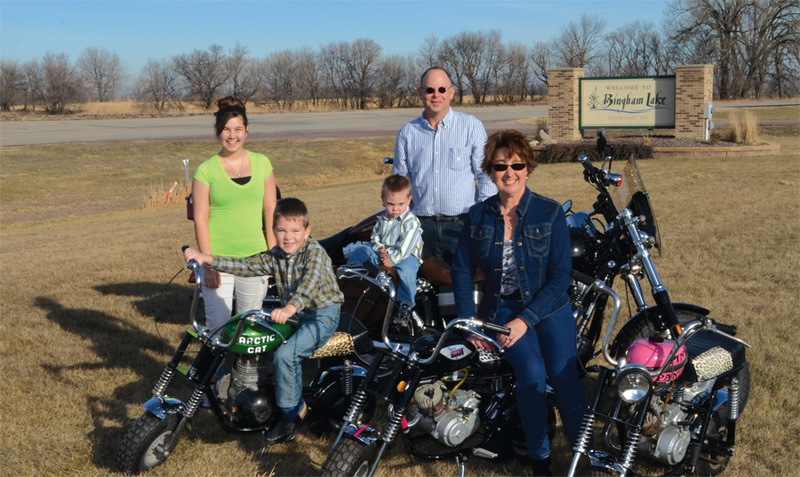 Darren Kalvig and his family enjoy an afternoon on his beloved bikes. Picture left to right: Savanah (17), Gunnar (6), Liam (3), Darren and Trina. People who know Darren Kalvig describe him as tenacious and trustworthy, persistent and a people person. Ideal qualities for someone who, as Commodities Manager, is in charge of buying the one million bushels of corn per month needed to keep operations running at POET’s biorefinery in Bingham Lake, Minn. In that time, Kalvig has seen firsthand the biofuel industry expand and advance “beyond his wildest dreams.” Kalvig, though, points to the one constant through the years – POET’s relationship with its farmers/suppliers – as the part of his job that he is most proud of. And it’s that part of his job that keeps the plant producing 35 million gallons of ethanol annually. Those are also the qualities, incidentally, that serve Kalvig well in his “part-time” job – as the mayor of Bingham Lake. Since 2005, Kalvig has worn the many hats that come with a small-city mayorship – he’s the dog catcher and the constable and the one-man complaint department. Vital: So, in your spare time, you’re the mayor of Bingham Lake, Minn.? Darren: Yes. I just got re-elected. Darren [laughing]: I know it. I was a little worried on this one. So you’re the one the people call in the middle of the night for sewer and water and police? Darren: We’re a population of 180 roughly. There are 55 houses in town and three or four businesses. We don’t have the funds like the bigger towns do. So you get called in the middle of the night. And weekends. I’m also the constable, so if the neighbors don’t get along they call me. I’m the dog catcher, so I get dog calls. But I love it. Darren: It gives me a chance to give back to the community and to build relationships with the residents. Those are things I really care about. You and Jeff Broin knew each other growing up in Kenyon, Minn.? Darren: Yes. We’ve been friends since the fifth grade. He said he was the farm kid and you were the town kid. Darren: Exactly. We both had a love for motorcycling and cars and, of course, girls. We just really clicked. Did you two get in a lot of trouble together as well? Darren: Absolutely, but I’m not going to talk about that. You mentioned a love of motorcycling. Are you the Darren Kalvig that I found online that is into Arctic Cat mini bikes? OK. Here are a few questions to see how much you really know. In what year did Arctic Cat come out with its mini bike lineup? Darren: 1970 was the first year. They made them for three years. Excellent. If you are restoring an Arctic Cat mini bike equipped with the Saxonette motor, be sure to check for what? Darren: Cracks on the frame. That was a weak point on those models. Yes! So you really do know your stuff. Do you rebuild them? Darren: I do. It’s been kind of put on hold. When I started doing that, it was really a way for my stepdaughter and me to bond. She was into all that. … When we were trying to form that relationship, I said ‘You know, let’s get a couple of mini bikes.’ Then I went a bit head over heels on the whole thing and really got into it. Darren: My wife wants them out of the shed. I’ve got a 15-by-30 single car garage that is full. Darren: My wife is Trina. My stepdaughter, Savanah, is 17. Trina and I have two boys. Gunnar is 6 and Liam is 3. I’ve been lucky. You started at POET’s Scotland (S.D.) plant in 1994? Darren: November 14 of ‘94. My job was what today would be called a commodities supervisor. Tell me about taking that Scotland job. Darren: I was a hometown kid. I thought I’d be living in Kenyon forever. But when that chance came up I loaded up my pickup and my trailer and packed everything I owned and moved out there. It was time for me to try something else, and so I took a chance and did it. And it’s been great. How did you and Trina meet? Darren: Through some motorcycle friends. They set me up on a blind date followed by a few motorcycle rides. Love of my life. Do you still ride now? Darren: We do. Not as often. I used to average about 12,000 miles a year, but now it’s maybe 1,000. I’ve made that commitment to being a family man, so we try to spend weekend time with the kids now. Did you expect the biofuel industry to grow like this when you started? Darren: I’ve always been a big believer in biofuels. But when I started the industry was still, in many ways, pretty young. We were doing things that no one had done before. It’s really kept me on my toes. We’re always learning new things and getting better. What’s your favorite part of your POET job? To try and bring in corn? Darren: Yes. That’s what I have to do. I have to bring in a million bushels per month. And I haven’t run us out of corn yet. Not for one minute. You’re thinking about buying corn right now, aren’t you? Darren: I’m always thinking about buying corn. Always. I even dream about it.